Around 440,000 people live the City of Manchester. Manchester’s landmark galleries and museums like Daniel Libeskind’s Imperial War Museum North, the Museum of Science and Industry and the Manchester Art Gallery give you the chance to view fantastic permanent and touring exhibitions. If you like to make a night of it, take in a show at the Royal Exchange, the Lowry or one of many other theatrical and concert venues. See for yourself why Manchester’s taking centre stage. Manchester’s cultural mix adds up to a great range of places to eat and drink. From Michelin-style gourmet to fresh local produce at speciality markets, from stylish venues for intimate occasions to out-of-the-way places for a good, cheap meal with friends, there’s good food aplenty in Manchester. You can eat your way around the World in Manchester, sampling everything from Armenian to Australian to African. There are the sights and smells of Chinatown and Rusholme’s Curry Mile, up market and traditional takes on Italian, Spanish and French, and a host of International restaurants offering gourmet global fare. When it comes to sport, Manchester punches above its weight. The Commonwealth Games of 2002 confirmed its importance, but for many years the city has played a significant role in the heritage of English sport. Manchester does funky, fashionable, chic and sleek better than anywhere else in the country. Retail therapy is a speciality. Hunt down something unique at Saturday’s Tib Street fashion market, browse for vintage chic and rare records in Northern Quarter, or cruise the designer stores and then relax with a long lunch and cocktails in Harvey Nichols’ brasserie. Manchester is a treasure trove of knick-knacks and collectables. Head for a gift shop within one of the city’s arts centres or browse its quirky arcades. Either way, make room in your diary because you may be some time. High street shopping in Manchester city centre is worth more then one day’s attention. Why not book one of the many hotels in Manchester and get the complete Manchester experience. Manchester’s dedication to amazing nights out goes on – and on. Its world famous nightlife attracts visitors from all over the UK and overseas. The club scene made famous by the Haçienda continues to draw crowds. And there’s a stack of smaller, edgier live music venues offering you a chance to catch the next Smiths or Stone Roses. Testing, testing, one, two, one, two… Manchester has made such a huge contribution to music’s Hall of Fame that whenever you go out you always feel there’s a chance you could run into the next pop messiah or rock god, just waiting to be discovered. ……….Fancy a drink? With an endless choice of cutting-edge designer hangouts, traditional boozers, cathedral-sized bars, chi chi lounges and comfy watering holes, your only problem in this town will be where to start. There’s no better time to visit Manchester than at Christmas. With fantastic festivals and theatre, Christmas Markets, late night shopping and themed evenings at Manchester’s historic houses and parks, there’s something for all. The birthplace of the industrial revolution, Manchester is recognised as the UK’s second city and the capital of the North. A centre for business, commerce, media and culture it has a population of 2.6 million people and in 2006 in a poll of British business leaders it was recognised as the best place to locate a business in the UK. With the development of Media City UK in the past year the BBC have moved over 15,000 staff to the area, providing a huge boost to the local economy. 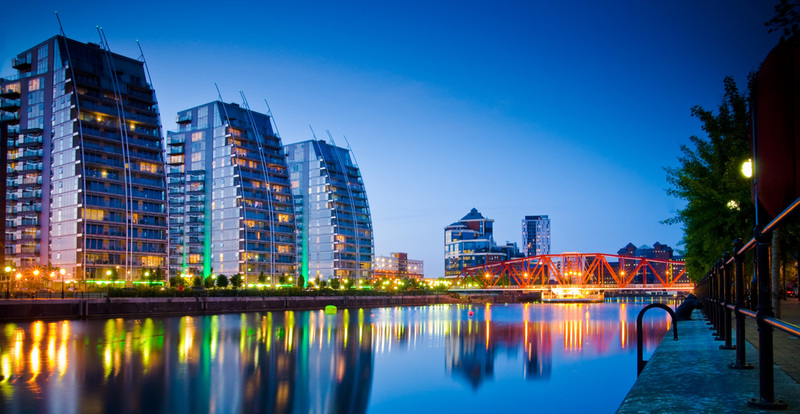 With such a beautiful range of properties available in Manchester and close to Media City there is no better time to invest than at the moment. With excellent infrastructure, a highly efficient public transport system (including the Metrolink tram system), an international airport and 3 of the UK’s best Universities, Manchester is one of the world’s most liveable cities. It is a thriving cultural capital and has a rich history of producing much of the nation’s favourite music, theatre and television. Home to both Manchester United and Manchester City football clubs it can now proudly claim to be the world’s football capital. Manchester also has a burgeoning culinary scene and has a huge number of high quality restaurants from a variety of world cuisines; it also boasts the largest China Town in the UK. With all this on offer, don’t miss out on this once in a life time opportunity to invest in the UK’s fastest growing and most exciting city.